Well, well, well, what have we here? 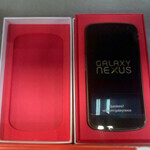 It’s a 4G LTE Galaxy Nexus in a unmarked white box lined with Verizon red. According to the tipster that supplied the photos the phones are being shipped to Verizon stores this week. It’s intriguing that the box is white and unmarked, although there could be a slip cover that will cover it at retail. The red interior is certainly different than the GSM units that have shipped. Although some have suggested that there is a visible seam around the words “Galaxy Nexus” on the Verizon manual, the phone itself is clearly the Verizon version (and shows no signs of manipulation), so it seems unlikely that there would be any reason to fake the manual. It’s also worth noting that jpeg compression can cause artifacting around words like this, so with no other signs of fakery it would appear we have the Real McCoy on our hands. The latest rumors have been pointing to a Verizon launch on the 8th or the 11th of the month; official renders are showing up buried on Verizon's website, and if retail units are indeed on their way to stores now, it would seem reasonable that we might see the phone go on sale sometime in the next week. Finally can trade in this tiny screen iPhone 4S. So you gonna downgrade from a mustang to a jalopy lol? Btw, go on ahead and thumb this comment down. Android fans are bitter enough to do so. Not an Android fan, but you're welcome. The Miz just STFU for once at least he's getting a better phone. Haha the miz thinks a mustang is a nice car. yeah, i really think so. the only way i wouldnt is if i caught wind of something cooler coming along soon, but im so tired of waiting (been sitting on an upgrade for over a year). plus, i really do like this device. i have an X with 2.2 now, which is a good phone, but crashes often. i had a palm pre plus before this and i LOVED webOS. take my phone, make it much faster, bigger better screen, more stability and some webOS flair...............i know im going to love this thing. CANT WAIT!!!!!!!!!!!!!!!!!!!!!!!!!!!!!! My jingle balls are turning blue. Ha! Ha! Ha! You cracked me up. Quick, Time to check my enroute purchase orders!!! PA? Close enough! Kind of! This is great news for Verizon users, Im hoping to just get some ICS on my Photon within a couple of months. I would love to get some ICS on my tbolt too! Boo Ya!! Lets go VZ! hurry up so i can get the HSPA+ verison on another carrier!!!!!!!!!!!!!!!! Why would you want a HSPA+ if you could get the better, LTE version? Im with lewis i also want the hspa+ version because some of us like me live were verizon is not good and at&t works fine. I also agree with lewis i want the gsm hspa+ version of this phone only if it came to at&t... because like he said u can use it on different carriers all u gotta is unlock them and pop in a sim card from the place you going something u cannot do with the verizon LTE version for those who travel europe or mexico or canada or asia whereever they go they never have to pay roaming charges cuz u just buy a local sim from the place ur going. Ive done it before with my at&t iphone 4 i got it unlocked and used it in mexico with a Telcel sim and everything worked perfect i got 3G data, calling etc everything worked all without having to pay them high roaming fees once i got back to miami i put my at&t sim and everything went back to normal. AdianShadows. I have a Atrix with H+. I have no problems with my service. Its better than 3G.